This campaign is to bring consciousness about the less known languages and cultures that are otherwise missing from the mainstream narratives, digitally-document them, and upload them on Wikimedia Commons, the sister project of Wikipedia and home to millions of media files that can be shared and reused. Identify a less known linguistic or cultural heritage. A marginalized language, a less known dance, or folk song, a rare and unique game played in your community could be a good example. Take a picture, and/or record as audio/video. • For audio and video try to record in a quieter place to avoid any background noise being recorded. • Ensure that the radio or television or a music player is not being played in the background so that you don’t accidentally record any audio/video that is copyrighted by someone else. 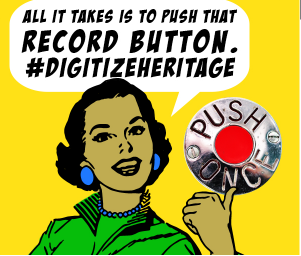 Add the category “Media uploaded during DigitizeHeritage campaign‎” while uploading. Keep an eye on your talk page for some surprises from us for your contribution!